Q: Good day Kiril, congratulations on setting a new world record. Tell me first – how did you actually get the idea to break the record? A: Thank you very much. Well, some two months ago I spoke with Nikolay Todorov, the Chairman of the chess club “Levski” Sofia, and he came up with the idea of breaking the world record. I was hesitating for a while, but then I realised that I have a good chance to achieve this and so I finally said “yes” and begun with preparation. Q: You knew how exhausting it can be? Seance would be taking many hours? A: Of course, I was aware that this would be very difficult to complete. 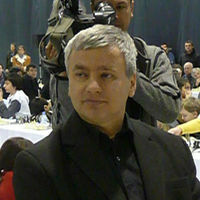 I am a chess professional and until now my personal record was 45 simultaneous games. This project was very demanding, in both physical and psychological aspect. An ordinary chess game can last up to 6 or 7 hours, but with this simul nobody could have guessed how long it will take. We were expecting 10 hours maybe, but it lasted a bit over 14. Q: You were playing very sharp, all games opened with 1. e4. Was this part of your plan, to quickly eliminate as many opponents as possible? A: Exactly, 1. e4 is the fastest way to reach the opponent’s King. I wanted to make many quick wins in order to ease the walk and shorten the circle. I believe this was the right decision, I played sharp, with many gambits, pawn sacrifices, to keep the enemy King in the middle of the table and make a quick assault. Q: Are you planning to take a shot at other records? A: No (laughing), I won’t even think about it. Q: So you will probably focus on your regular chess career. Where will you be playing next? Q: A month ago you were playing the Fischer Memorial in Pancevo, how was this tournament for you? A: It was an excellent opportunity for me to extend the preparation for the record attempt. That was rapid event and I used it to train the fast play because I also wanted to play fast in the simul – not more than 3 seconds per move. Kiril also explained that the Guinness rules were very strict. For example, he was not allowed to make “Spassky move” and invite all players to open 1. e4, thus sparing him a circle. It was also forbidden to play more than one move on the same board until the full circle was made.